What are some major archaeological discoveries that have impacted our understanding of the Bible? Dr. Fleming: Because there are so many discoveries, let's focus on a few that relate to the life of Jesus, more specifically His last week. Jesus' life is firmly rooted in history. For some of the main players in the Gospel stories, we have found some things about them. 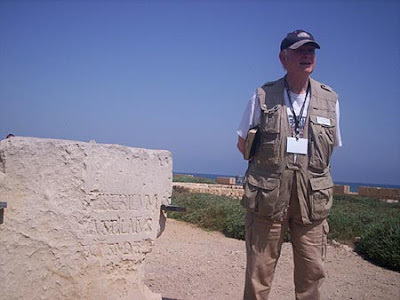 For example, a stone has been found in Caesarea that mentions Pontius Pilate, the Proconsul and Procurator of Judea. It was found in the theater of Caesarea. We found the tomb of Caiaphas the High Priest. A bone box, called an ossuary, said "Joseph Kayafa." We find from Josephus his first name was Joseph. The Tomb of Annas the previous High Priest was found, which was described by Josephus in the First Century AD as being near where the Hinnom and the Kidron Valleys join in Jerusalem. There is the most ornamental tomb from the First Century found right there at that junction. We have found a tomb, believe it or not, with a bone box in it that's inscribed "Simon of Cyrene." Next to that box is another inscribed "Alexander of Cyrene son of Simon." May I remind you that in the New Testament we find Simon who was forced to carry the cross, and the text also says, "Whose sons were Rufus and Alexander." So, that certainly has to be it. The man who donated the money for the Corinthian bronze gate to enter the Temple, called the Nicanor Gate, there was a tomb found in the Mount of Olives, and Nicanor was the one who gave the Temple gate. Isn't it interesting that we have these contact points with the life of Jesus? Dr. Reagan: I think it is absolutely fascinating! I would like to go back to one of them you mentioned, and that is the Pilate inscription (below) that was found in Caesarea Maritime in the theater there when it was being excavating. I have seen this several times. It appears to me to be like the kind of plaque you would find in a post office in America that would say, "This Post Office was built during the time when Eisenhower was President and so and so was Governor of Ohio." And, that is basically what it says, that Tiberius is Emperor and Pontius Pilate is Governor. Dr. Fleming: Yes. Pilate built a Tiberium as a site to honor Tiberius Caesar. Pilate was 26 to 36 AD, and so most people put the crucifixion about midway during his reign. Again, isn't it great that we have that contact point with these characters mentioned in the story? Nathan Jones: Didn't the Pilate stone end up in a very questionable place? Dr. Fleming: It'd been recycled. It had probably been on a wall honoring this Tiberium, but when they were redoing the orchestra area of the theater it was simply reused. Pontius Pilate ended up in disgrace. In fact, he was banished in 36 AD and committed suicide in his banishment because he was so ashamed. That stone was simply used as part of a stairway for the platform, and part of the letters were shaved off so it would fit right. Dr. Reagan: What is the significance of finding Pilate's name on something? Is this the only place we found it? I think Pilate is mentioned in the writings of Josephus, isn't he? Dr. Fleming: Yes. Actually, to find an inscription in stone with his name on it, it is the only one. Other ones may come up, although his reign was just that ten year period. We have many mentioning the emperors, of course, but with the local governors you don't always find their names. Dr. Reagan: You mentioned the bone box of the ossuary of the High Priest Caiaphas. Boy, that was quite a discovery, wasn't it? Dr. Fleming: Yes, and now about 2,000 bone boxes have been found. Then you had a primary burial and a secondary burial. After the body decomposed, though it sounds funny to us, the Jews would collect the bones. Bone boxes were usually long enough for the long bones and wide enough for the skull. A 1,000 of these bone boxes had names on them, and another 1,000 had no name. The relatives in the tomb, of course, knew who was in that box, but this gives us the common names in the time of Jesus. What is so great about finding these ossuaries in Judea is that we don't find them before 36 BC and not after 70 AD. We have this short 100 year period when this way of burying was popular, and it tells us what were the popular names during that 100 year period. Dr. Reagan: In collecting the bones into bone boxes, was that so the tomb could be used again? Dr. Fleming: Yes, over and over and over again. Now, a body in Jerusalem's climate takes about two years to decompose. In drier places like Jericho it would take longer. The ossuaries tell us, for example, that there were very few distinct first names in that time. A lot of people had the same names, and so almost 20% of the people were named Simon. Mary was a name claimed by 40% of the women in variations like Miriam and Maria. Nathan Jones: It would be like Deborah today? 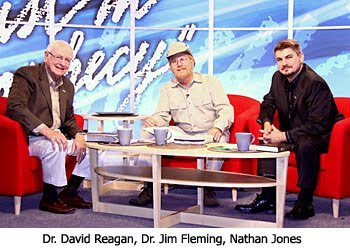 Dr. Reagan: We see that in the Gospels with Mary the mother of Jesus, Mary Magdalene, and the Mary's just go on and on. Dr. Fleming: How many Mary's there were! Wonderful article! Thanks so much! I find a correlation between the ossuaries boxes used in the time of Jesus and the same boxes used in north korea! the North Koreans also unbury the dead and locate the bones into boxes after the decompostiton has taken place! since the koreans also practice ancestor worship could it have some correlation to the middleasstern peoples doing the same! did at some point in time the semetics practice ancestor worship by removing the bones into boxes and into theri homes?